10% Student Discount at Dreams Beds Get some well-deserved rest with a selection of great quality beds & bedding at Dreams! 20% Off Bed Frames at Dreams Beds- Easter Flash Sale! Check out an Easter treat at Dreams Beds! £100 Off Tempur Mattresses Orders Plus 2 Free Pillows at Dreams Beds Save £100 on your new mattress today at Dreams Beds. Free Delivery on Orders Over £100 at Dreams Beds Why pay for delivery when you don't have to? Get it for free on orders over £100 at Dreams Beds. £200 Off Selected Mattresses at Dreams Beds - Including TheraPur, Regatta & Silent Night Buying a mattress doesn't have to break the bank, check out the deals at Dreams Beds. 20% Off Selected Duvets with Mattress Orders at Dreams Beds Ordering a new mattress? Why not treat yourself to a new duvet as well! Memory Foam Pillows from £30 at Dreams Get the best night's sleep possible with Memory Foam pillows. Sofa Beds from £299 at Dreams Perfect for your living room or bedroom, with a huge variety of styles, you need to check out the sofa beds at Dreams. Up to 50% Off Selected Bed Linen in the Clearance at Dreams Beds Check out the clearance sale at Dreams Beds for some incredible discounts! The environment in which you sleep in is vitally important; it should bring you joy as well as a sense of calm so that you can drift off to sleep every night and wake the next morning feeling nothing other than refreshed and revitalised. 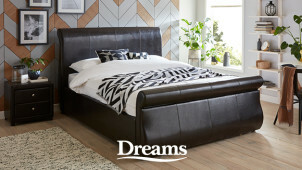 As well as a grand selection of beds, headboards and all-important mattresses, at Dreams you can also find furniture to help bring the whole style of your room together. Shop bedside tables, wardrobes, sofabeds and more - with endless style and quality in all of their products - it's never been easier to turn your dream space into a reality. With plenty of inspiration and advice online too, you can get creative with Dreams and take your boudoir to the next level. Stay cool with the latest in TV beds with Bluetooth connections, go for a classic metal frame or for more of an organic look with quality wooden frames. When it comes to choosing your mattress, Dreams recommends that you change yours every 8 years and the team are happy to advise you on how to pick the perfect one to suit you. Use the mattress guide and invest in goods which are designed with the latest technologies in mind to help cater to everyone's needs and support all different body types too. With fuss-free delivery and impeccable service every time - this is easy dreaming. How do I use my Dreams discount code? Your discounts will be automatically applied to your total so you can choose your delivery date and insert your payment details to checkout securely. Sign up to the Dreams' newsletter to stay in touch and updated on any special offers and discounts. Will my bed come under guarantee? The 40-night comfort guarantee from Dreams means that you can ensure optimum comfort from your new purchase. Simply request the ‘Comfort Exchange’ within the first 40 nights of the original product’s delivery and should you if you have an issue with your new mattress - Dreams will let you select an alternative mattress of the same size. Do check the Terms & Conditions. Does Dreams offer student discount? There isn’t currently a student discount available, however, keep checking vouchercloud to keep you updated on the latest deals. Am I able to buy my goods on finance? For ease of payment, Dreams gives you the option to pay for your goods using Interest-Free Credit which can help you spread the cost of your goods. Available with online orders over £400, with 0% interest and no deposit needed - you'll be sure to sleep easy. Do check the full Terms & Conditions. Where is my nearest Dreams store? You can find a Dreams close to you by using the online Store Locator. You could even book an appointment for when you arrive to get some sound advice on choosing your goods. Furniture Delivery is Free as Standard, while Bedding Delivery is Free for Orders over £100. Bedding Delivery is £4.95 otherwise. Furniture is custom-crafted, and typically take 8-10 weeks (and 5 working days to deliver). You'll be contacted 4-6 weeks in advance to arrange a delivery time that suits you. Bedding deliveries arrive within 5 working days. Items must be returned within 14 days of delivery - and home collection for items is charged at £39. Smaller items can be returned in store, or get in touch within 14 days to arrange returning items by post. You can also reach Dreams online by hitting 'submit a request'. There’s nothing quite like a good night's sleep and with a bed from Dreams you’ll feel like you’re sleeping amongst the clouds! With a huge selection of divan beds, ottomans, even tech beds and more - find the latest Dreams discount code from vouchercloud and pick up your new bed at a bargain price today. Dreams is committed to manufacturing only quality products at affordable prices, so now the whole family can get some well-deserved shut-eye. The hassle of getting rid of your old bed is now a thing of the past with the recycling service available from Dreams. Now it's easy to upgrade and be green by minimising your waste. To add this service to your order, you just have to ring 0800 652 5090 and they'll pick up your old bed or mattress when they deliver your new one to take it to a specialist bed recycling depot. Storage beds do really provide a helping hand for those who are short of space but already living minimal as it is. We're fans of the innovative Ottoman bed frames available at Dreams. Sturdy, modern and affordable, especially with a Dreams voucher code from us, this is the stylish way of hiding your bed sheets, towels, PJs and so much more. Now you can de-clutter and clear your head in preparation for the perfect 40 winks.